Rhinoplasty is one of the most commonly requested and performed cosmetic surgeries. It is desired amongst both men and women, young and old, and can create some of the most noticeable and stunning transformations. A nose that is oversized or has large nasal humps can create emotional stress and discomfort, and it is this discomfort that rhinoplasty can remedy. If you are considering rhinoplasty, here are some things to keep in mind. When Will My Results Become Apparent? The results of rhinoplasty are permanent and begin to show as soon as the bruising and swelling subside, which is typically after two weeks. With that said, it can take up to one year for your full and final results to appear. There are two options when it comes to rhinoplasty: the open and closed approach. Open rhinoplasty is performed through an incision at the base of your nose between the nostrils. This technique allows for full visibility of your nose and nasal concern. Unfortunately, because of its placement, there will be a visible scar; however, it will fade with time. Your other option is the closed approach. For years, closed rhinoplasty was the only technique available. This is the preferred method because it does not result in visible scarring as the incisions are made within the nasal cavity. During your consultation, you will be given options and recommendations dependent on the specific needs of your nose. Can I Combine Cosmetic Rhinoplasty With Septoplasty? Septoplasty is a form of rhinoplasty that targets the functionality of the nose instead of the aesthetics. Septoplasty is typically performed on noses with a deviated septum (either caused by injury or by birth), which affects the patient’s ability to breathe or sleep. While septoplasty alone does not change the look of the nose, it can be performed in conjunction with rhinoplasty to improve both the appearance and functionality. What Are the Limitations of Rhinoplasty? Often, patients go into their surgeon’s office with the picture of a celebrity or model who, in their opinion, has “the perfect nose.” While bringing in examples you like can be beneficial, it is not guaranteed that you will be able to achieve a replica of the nose you request. 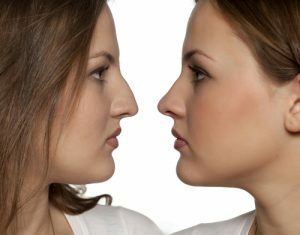 Dr. Rey can take characteristics of that nose and apply it to your rhinoplasty; however, no cosmetic surgery can make you look identical to another person. Cosmetic surgery aims to enhance your natural features rather than create entirely new ones.